It wasn’t all that long ago in fact that there did used to be lifts. 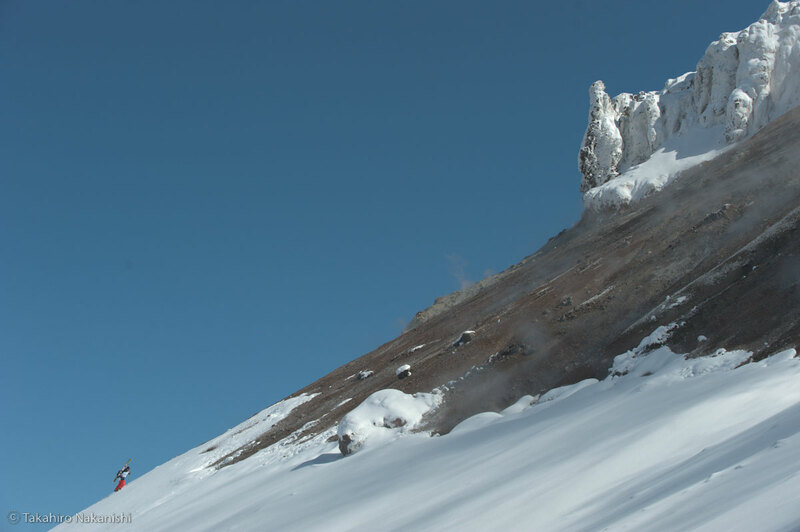 These were right on the volcano itself and you could ski nearly 1,000 meters vertical down to the hot spring village of Shirogane. The last volcanic eruption in 1988 damaged part of the lift system and it was decided to disband the resort. There isn’t much evidence of it now, except for an overgrown dirt road with decrepit lights that used to illuminate the course. Yes, there was even night skiing. 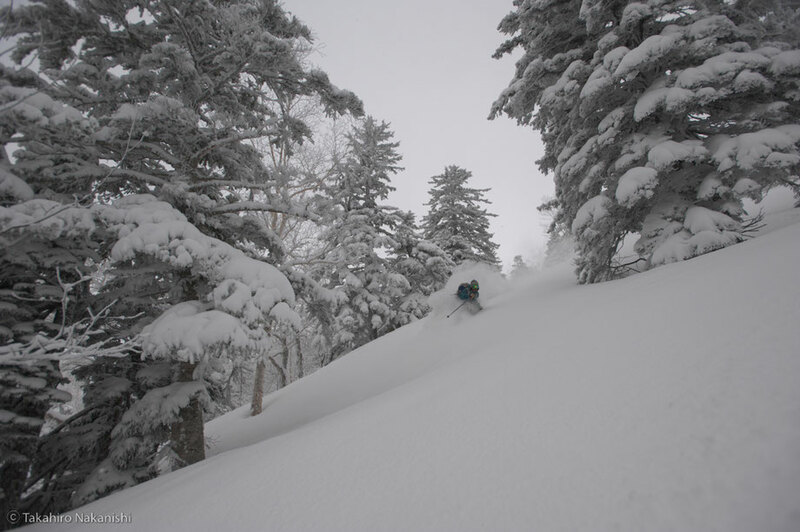 All the turns in the area now have to be earned and the locals wouldn’t have it any other way. 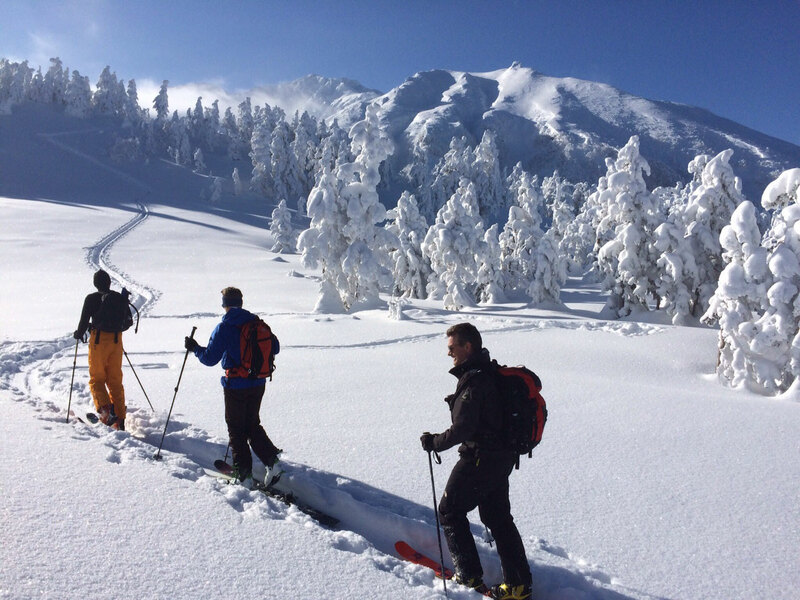 This is the premier backcountry location of Hokkaido, for the ease of access to a number of mountains from the road, the opportunity to ski genuine alpine terrain, and of course, for the snow. It could be some of the lightest on the planet. But snow wasn’t what brought the first people to the area. It was the hot thermal springs which contain various minerals. There are four accommodations that sit perched by the roadside between 1,000 and 1,350 meters, each with their own spring. 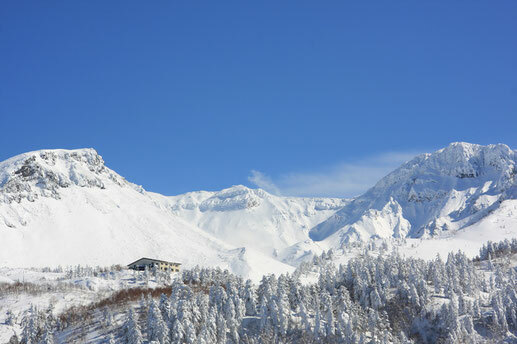 At the top of the road there is Ryounkaku, also known as Tokachidake Onsen, owned by the Aida family. It was their grandfather who founded the hot spring. He spent three years laboriously searching for spring water. When he finally found its source, he spent another few years hauling the materials by horseback up the road to build the first hotel building. Behind Ryounkaku’s hotel reception, Aida san’s portrait sits on the wall. His great grandchildren now play under his stately gaze, and the legacy that he created will likely extend for generations, as is the tradition in Japan. At the time he wouldn’t have known that the surrounding mountains would become renowned. But it wasn’t for the mineral springs he pioneered to find, but for the skiing. Some of the first skiers were his own grandchildren, who used to ski down the road to catch the school bus. Now, international backcountry skiers number almost the same number of Japanese during the months of January and February, all seeking Daisetsuzan’s mythical powder. Many of these international skiers may not see the peaks during their stay, such is the weather. 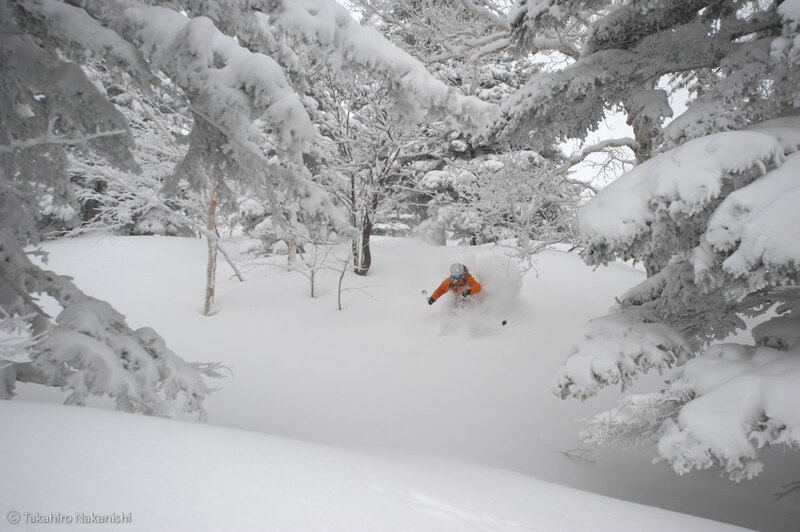 But it is the clearer days that allow us to ski the alpine that we prefer to ski Tokachidake. Tree line is only around 350 meters above the parking, which can be limiting on inclement days. Most of the skiing during the stormier months of January and February are on the more accessible minor peaks, which offer about 750 meters vertical. 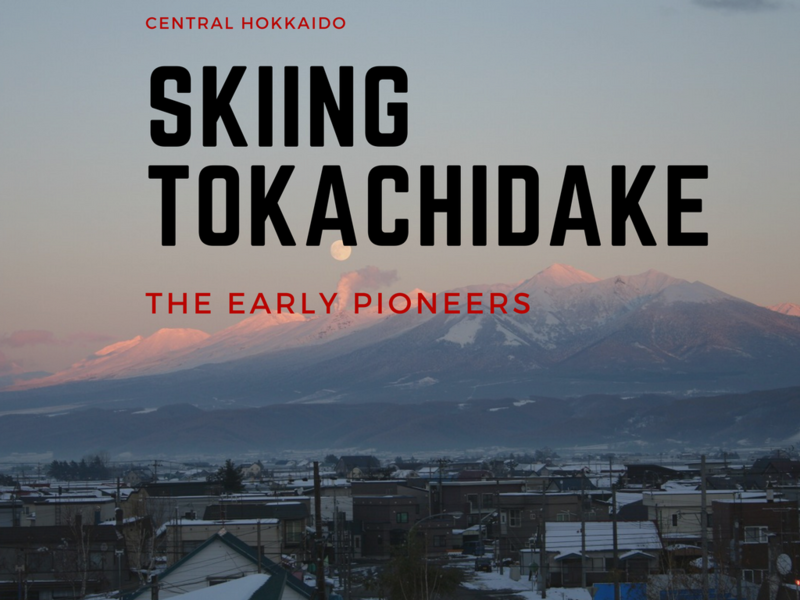 These include ‘Mae Tokachidake,’ meaning ‘Frontside Tokachi,’ ‘Sandanyama,’ or the ‘Three Stepped Mountain,’ and also ‘Furandake.' 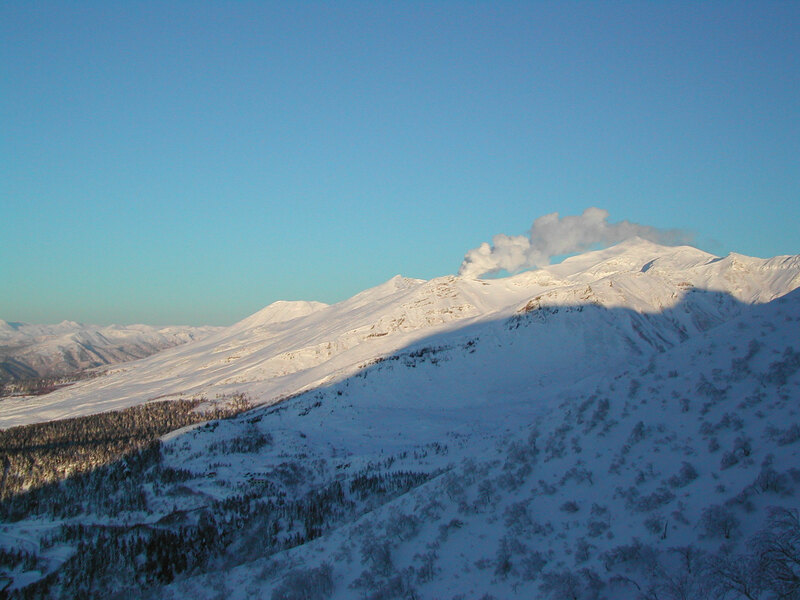 The name Furano derives from the Ainu name of ‘Furanui,’ which means ‘smelly.’ Sometimes the sulphur from the volcano can be smelled on adjacent peaks. For touring focused days with good weather, skiing is possible from the major 2,000 meter peaks. March and April are the better months for these. In fine weather, you will descend from the alpine, in to widely spaced silver birch. Then there is the old growth spruce, and their massive branches that hold the tons of snow that accumulates continuously through the season. Out from the forest, you then ski to the springs, where the hot mineral water warms the body and soothes the aches. 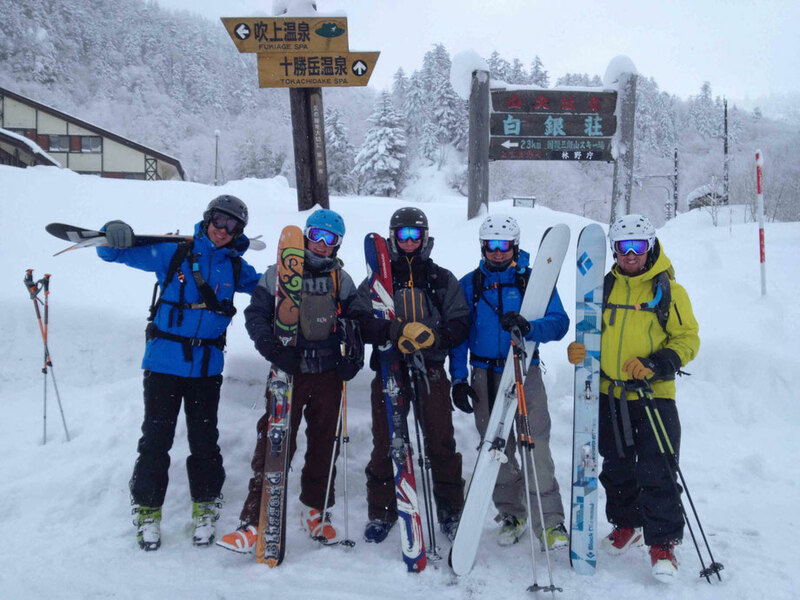 This is Japanese backcountry aprè, and how we finish Tokachidake days. Old Aida san would have been happy.